Welcome to Ireland’s newest and most exciting up and coming activity which can be brought to everyone. Archery Tag provides a fun new way to develop team bonding. This activity can be run in a hall, on a pitch or even in your back yard. We can run to your schedule so accessibility couldn’t be easier! Games can run from 1 to 3 hrs depending on your needs. Book your Archery Tag group today! Let’s get started on booking your Archery Tag® adventure. Click on the button below to contact us with your requirements and preferred location for your group. Archery Tag® is played similar to dodgeball with our bows and patented foam-tipped arrows. This exciting, action-packed game offers the ultimate family-friendly experience that engages everyone. Don’t miss out on Tag … The game you never outgrow! 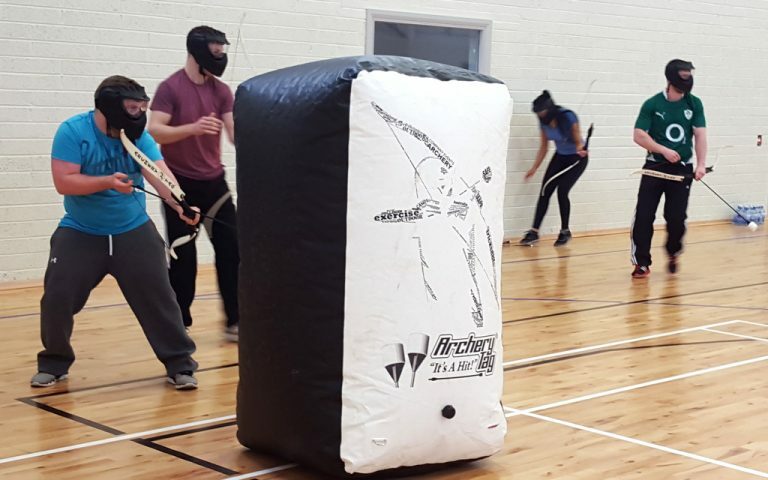 Unlike some other sports, the only safety equipment required to play Archery Tag® is a facemask. Players experience virtually no pain when “hit” with our Archery Tag® arrows. Two teams, consisting of 5 players each playing opposite one another, are separated by a “safe zone.” Each team also has what we call a “5-Spot Knockout Target.” There are two objectives: 1) to hit the opponents, and 2) to knock out the five discs of the opposing team’s target. You eliminate a player by hitting him or her with an arrow, or by catching his or her arrow. The 5-Spot Targets work to save a “life” of one of the players. A “hit” player can be called back into the game when a target spot is knocked out or when a teammate catches an arrow.